Volksvagen South Africa’s music and lifestyle festival are 2018 was a huge success. It’s back for a second year. 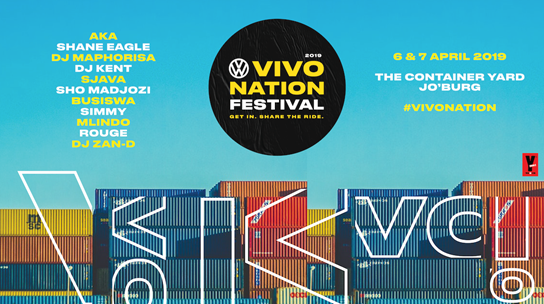 For two days, Saturday 6 and Sunday 7 April 2019, VW VIVOnation will transform The Container Yard in New Doornfontein into a multi-layered festival of varied experiences. The audience will become a part of an unmissable weekend of music, food, friends, high octane, tyre-screeching fun and new experiences. Last year, thousands of people got a chance to enjoyed riding the newly launched Polo Vivo – number one car in South Africa. This year massive containers are repurposed to create an edgy space. Here, you’ll get a chance to enjoy music by biggest and hottest artists such as AKA, ShaneEagle, Sho Madjozi, Busiswa, DJMaphorisa, DJKent, Rouge, Simmy, Mlindo and Sjava all in one place. And that’s not all. Fans will get a chance to enjoy thrilling rides across the Vivo autocross track and sing their hearts out to win a road trip in the Vivo lip sync competition. So, what are you waiting for? Get in action now! Venue: The Container Yard, Impex Avenue, City Deep, downtown Joburg. Tickets: R50 per person for either Saturday or Sunday available at www.vwvivonation.co.za. On arrival, your ticket will be converted into free R50 food and drink voucher. Ticket holders can plenty of spot prizes if they arrive between 13:00 and 15:00 throughout the day. Each person can buy a maximum of FOUR tickets. Every ticket will be sent to the unique email address supplied. The VW #VIVOnation is proudly partnered with YFM. This festival is not for individuals under the age of 18 years.